When I was in college, I met a guy who hit his girlfriend harder than he intended to – and killed her. I have often imagined –let’s call him Peter–looking at his girlfriend’s body on the floor, hoping desperately that it hadn’t really happened, that she would actually be ok. Then, at some point, his distress at the broken body got pushed aside by the recognition of his own situation, and he was caught between his horror at what he had done and a competing awareness that he was in serious trouble. Maybe right away, maybe days later, his own plight trumped the trauma of the death and his role in it, and the focus of his waking hours turned urgently to self-defense as he tried to get out of the awful prospect in front of him: years in jail. 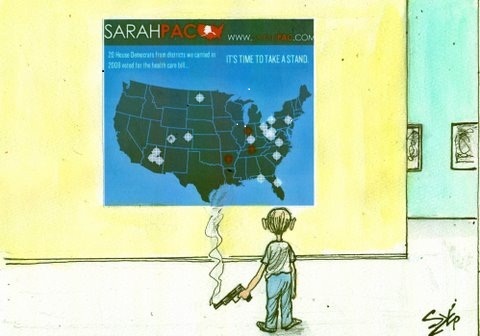 A lot of people on the Left assume Palin’s protestations of regret over the Tucson massacre are staged, a contrived denial of complicity that has been orchestrated by her handlers and media figures who also have made a living by becking: using violent metaphors and images to dehumanize opponents with little regard for the consequences. I’m not so sure. It is easy to attribute crass sociopathy to people who merely are playing what they perceive as a survival game. Palin’s whole identity at this point is caught up in celebrity and political status, and a threat to identity is a survival threat. The rapid removal of Palin’s crosshairs map . . . The formal statements denying that the crosshairs ever were intended to represent gun scopes (despite documentary evidence of her “Don’t retreat, reload” and “lock and load” comments) . . . These are survival moves. Like Peter at some point in his process, Sarah may be wholly consumed at this point with her own situation. But that doesn’t mean the regret is false. Some of my more awful moments in life have been when I meant to hurt someone but did more damage that I intended. I have very hazy memories of childhood, but I recall vividly the time when I yelled and slapped my sister and watched her crumple into a sobbing heap. Or the time when I put a hose down a gopher hole intending to drive the creatures out—and instead drowned little baby rabbits who came struggling out, wet and dying. The problem with hurting someone more than you intend is that you can’t quite get away from it. The normal process of self-exoneration doesn’t work, and the after-images can be haunting. Glen Beck himself has been lucky. The unhinged killer who most explicitly took his divine calling from Beck, Byron Williams, was stopped by the Oakland police, averting his intended massacre at the Tides Foundation and ACLU. Much of the becking done by politicians gratefully has been consequence free. An estimated 24 Americans have died at the hands of domestic right wing extremists in the last 24 months. But few of the murders have involved any linkage so explicit as Palin’s crosshairs or Giffords’ poignant remarks about words and their consequences. It is easier to sleep at night when one words simply augment a culture of violence rather than when they presage a specific tragedy. When one has done unintended harm – or more harm than intended, I think it is the wee hours of the morning that are worst. In a place that is safe and warm, the frenetic mental activity of self-defense quiets down and offers no barrier against the haunting question, “What have I done?” I used to think about Peter in his cell, awake in the dark, reliving those few intractable seconds and the words that came before them. I don’t respect Sarah Palin, but I do feel bad for her. Gallery | This entry was posted in Christianity in the Public Square and tagged becking, Gabrielle Giffords, Sarah Palin, violent rhetoric. Bookmark the permalink. I watched her scripted speech online right before the President’s live address and I can’t believe that there’s a significant population in our country that would want her to be President. But I don’t feel sorry for her. My harsher criticisms are reserved for John McCain. Sarah Palin would not be where she is today if it wasn’t for him. I heard yesterday that 25 percent of Americans say that Sarah Palin shares their spiritual values. Given that she seems rather the antithesis of spiritual, it take it as a testament to the power of tribal identity — in this case tribal religion that shapes indentity by defining an ingroup and an outgroup. Peter doesn’t feel sorry he killed his girlfriend. He feels sorry he’s in jail. If he could murder his girlfriend without going to jail, he’d be a happy man today. He’s probably mad at his girlfriend for getting him into his predicament. Likewise, Palin feels no remorse for Gifford. She’s sorry that the shooting is giving her bad press. If the public, or even just the Republicans, hailed Loughner as a hero for eliminating the enemy, Palin would enjoy assuming responsibility for inciting the attack. I don’t feel sorry for Peter the murderer, and I don’t feel sorry for Palin the murder accomplice. Well, you might be right. I just think it’s easy to overassume that our enemies are psychopaths –inherently evil people without conscience. Epic films and stories are usually built around that premise. The bad guys are orcs, from a psychological standpoint even if not from a physical standpoint. But I suspect that it can’t be as true as it feels–so I try to force myself (only in my more rational moments when i’m not tired or hormonal) to try on other assumptions. But again, you may be right.